TaoTronics is one of the world-class leaders in small accessories industry, including car parts, headphones, and various other items. 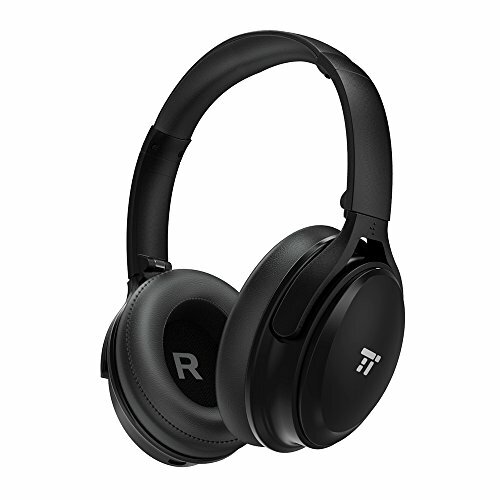 The reason why we’re doing this Taotronics Bluetooth headphones review is that this brand makes some of the finest entry-level headphones which can easily go toe to toe with their high-end counterparts. What makes Taotronics headphones different? 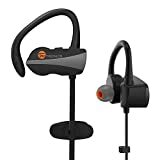 Essentially, most TaoTronics headphones boast a wide array of special features which provide qualities much alike to the ones within the “high-end” price point categories. Most of these headphones are outfitted with Bluetooth connection features, boasting water and sweat-proof qualities, and such. Now, the best thing about TaoTronics headphones is that they can give you all of this at an affordable price. Usually, you’ll have to pay top dollar to get a set of sweat-proof headphones, and that’s without any guarantees that other features would be good. The last item in our review is really something – these TaoTronics headphones boast a splash-proof design, feature eight hours of battery lifespan, and come supplied with CVC and Bluetooth technologies. Overall, they’re pretty affordable and do a major bang for the buck. These headphones feature a splash-proof design – they come outfitted with special Nano coats that protect your earphones from the rain. Furthermore, they’re as lightweight as they are comfortable, as they boast an ergonomic design – they’re made of superbly elastic, fine silicon-based materials, and weigh approximately 15 grams. You’ll be able to use them for eight hours continuously (charging time is 2 hours), making them ideal for workouts, strolls, and more. The CVC technology allows for crisp, high-quality calls while the latest Bluetooth technology benefits fast & easy pairing. Just like the first TaoTronics headphones we’ve reviewed, these ones also feature magnets that allow you to attach the ends when you’re done listening to music. We’re reviewing yet another model of TaoTronics “sports in-ear headphones” mainly because this one fares better in terms of aesthetics when compared to the previous one. Most sports people prefer plain and straightforward phones without paying too much heed on how they look, but this model is for those who disagree. You’ll be able to choose from three color variations, each being beautiful in its own right. Certain features are pretty standard, but you’ll like the majority of them if you value high-quality sound output and convenience. The first most notable feature of these headphones is the Bluetooth 4.1 feature. Even though it’s not the latest technology, it works like a charm – fast and reliable. These headphones are compatible with most iPhones and smartphones, and allow for easy and quick pairing. The same CVC noise-canceling technology was implemented in the design of this model as well, reducing ambient noise and potential feedback. There are no issues with comfortability due to the convenient, secure-fit design. You’ll be able to enjoy them for 5 hours tops, which is pretty nice, but quite mediocre overall. Nevertheless, they’re very cheap, and they excel in numerous fields of performance. In-ear earbuds lovers, here we have quite a treat. TaoTronics in-ear earbuds are absolutely amazing, as they excel in various fields of performance. First of all, they look exquisitely beautiful, adorned with remarkable ear hooks. Secondly, the features they come supplied with are top-shelf, and you’ll certainly love how they sound due to CVC technology, among other things. 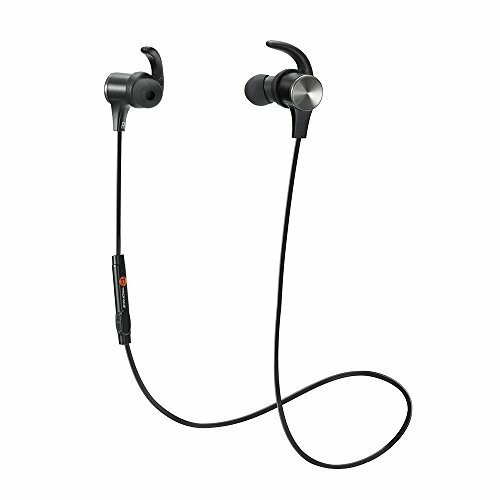 Just like most TaoTronics headphones, these ones boast the sweat-proof design as well. The ear hooks are pretty flexible but ensure a tight fit at all times while the soundstage comes comprised of top-quality hardware, ensuring superb sound quality. 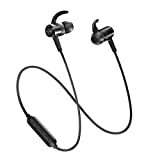 The Bluetooth 4.1 feature is quite common with TaoTronics headphones, such is the case with this one – you’ll be able to benefit from fast, secure Bleutooth connection and enjoy your music for up to seven hours. Apart from the CVC feature, there’s the integrated mic which will allow you to speak free of feedback and interference. On top of that, these headphones come equipped with a built-in antenna which enhances the overall audio quality and stabilizes the Bluetooth pairing. 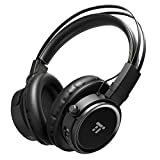 The connection loss is minimized, so it’s safe to say that these are some of the best TaoTronics headphones out there. Over-ear headphones are great for a number of things, and we’re reviewing some of TaoTronics finest ones. This model looks quite plain, but it boasts superb bass response, long-lasting playback capabilities, and state-of-the-art technology. TaoTronics over ear headphones are some of the best in our Taotronics Bluetooth headphones review. Namely, they feature an adjustable fit which ensures maximum comfort (along with 90-degree swiveling cups), an ergonomic headband, and protein ear-pads. While most headphones last for up to 10 hours or so, this model can withstand 25 hours of play time. The bass is heavily accentuated while the mid-stage feels balanced and decently crispy. Overall, the features of these TaoTronics headphones are quite awesome. This over-ear headphone model is substantially different from the one we’ve just reviewed – it costs pretty much the same, but it comes equipped with a set of different features and excels in different spheres of performance. The first thing you’ll notice on these headphones is the metal & leather combo design. These features ensure optimal durability without cutting back on flexibility and aesthetics. You can use the 3-in-1 control knob to choose your tracks, play or pause them, and to make a call. What’s more, the immersive aptX technology provides a significant boost to audio quality, fit for an audiophile. Even though most TaoTronics headphones come with Bluetooth 4.1, only a handful of models can boast with 20 hours of total playtime such as this one. The manufacturer used the latest CVC 6.0 technology to minimalize ambient sound and feedback, just as with other models we’ve mentioned so far. Neat, comfortable, and practical would be the words that best describe these headphones. 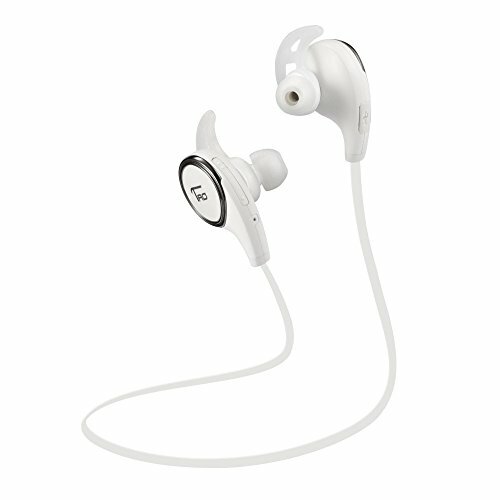 Generally, they feature superb bass output, a balanced soundstage, and a convenient, compact in-ear design. There’s a manifold of things you could like about them, and but a few that could be treated as disadvantages. These trendy headphones feature a small, in-ear design, adorned with elegant black and wild lime colors. They come outfitted with the Bluetooth 4.0 technology – even though it’s not the latest up-to-date Bluetooth edition, it still allows you to pair up two devices simultaneously. The low-power consumption is another benefit you could take advantage of, but note that these headphones need to be recharged quite frequently. They’re supposed to last up to seven hours within a charge, but they recharge back pretty quickly. Furthermore, the flexible, ergonomic, sweat-proof design makes these headphones suitable for various occasions. 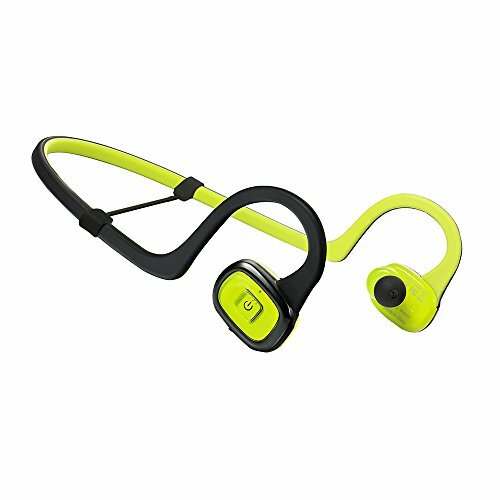 They’re favored by sportsmen, but any activity that requires mobility will be greeted with these headphones well. Last, but not least, there’s a built-in antenna made of ceramic materials that ensures a better sound reception and increases the quality of phone calls. Overall, these headphones are easily more than valuable for the cash. The first item in our review is TaoTronics Magnetic Earbud set. These beauties are available in five color variations, but the best thing about them is that they feature built-in magnets that allow you to simply string them together when you’re done using them. 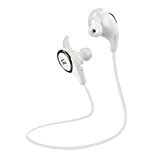 Overall, they’re pretty neat for people who like to listen to music on the go, as they feature long battery lifetime, superb Bluetooth technology, and ensure a proper, secure fit. These TaoTronics headphones feature a CVC 6.0 noise-canceling microphone which significantly reduces ambient noises, which substantially improves the call quality. They have a decently long battery lifespan – you can benefit from 6 hours of music with a single charge (note, standby time is approximately 175 hours). Furthermore, these headphones come with the Bluetooth 4.2 technology – you’ll benefit from fast, easy pairing with the majority of latest smartphones, tablets, music players, and similar hardware. Last, but not least, the special magnets on the sides of earbuds allow you to attach them when you’re not using them. 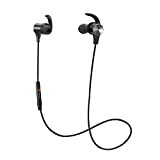 Simply put, TaoTronics headphones “borrow” the superb qualities of high-end models, but don’t cost as much. We hope that you’ve found our Taotronics Bluetooth headphones review helpful, and we wish you good luck in finding your best TaoTronics headphones!